The year 2011 will go down in history as a turning point for the Arab world. The popular unrest that swept across the region and led to the toppling of the Ben Ali, Mubarak, and Qaddhafi regimes in Tunisia, Egypt, and Libya has fundamentally altered the social, economic, and political outlooks of these countries and the region as a whole. This book assesses the transition processes unleashed by the uprisings that took place in Egypt and Tunisia in 2011. The wave of unrest and popular mobilisation that swept through these countries is treated as the point of departure of long and complex processes of change, manipulation, restructuring, and entrenchment of the institutional structures and logics that defined politics. The book explores the constitutive elements of institutional development, namely processes of constitution making, electoral politics, the changing status and power of the judiciary, and the interplay between the civilian and the military apparatuses in Egypt and Tunisia. It also considers the extent to which these two countries have become more democratic, as a result of their institutions being more legitimate, accountable, and responsive, at the beginning of 2014 and from a comparative perspective. The impact of temporal factors in shaping transition paths is highlighted throughout the book. 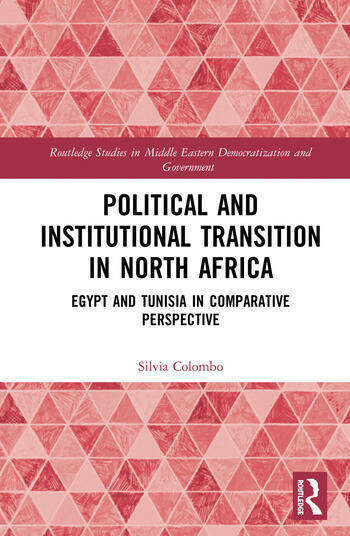 The book provides a comprehensive assessment of political and institutional transition processes in two key countries in North Africa and its conclusions shed light on similar processes that have taken place throughout the region since 2011. It will be a valuable resource for anyone studying Middle Eastern and North African politics, area studies, comparative institutional development and democratisation. Silvia Colombo is Head of the Mediterranean and Middle East Programme at the International Affairs Institute (IAI) in Rome. She works on Euro-Mediterranean cooperation and domestic and regional politics in the Arab world.